It's a sunny 85 degree day in June and I finally have some time to sit down and savor THE DECORATED HOME: LIVING WITH STYLE AND JOY. As I recline on the couch on my 3-season porch, the leaves on the branches sway in the gentle breeze - I glance up to spy a couple of gigantic yellow butterflies fluttering in the distance and a couple of squirrels chasing each other up a tree. I have a lemonade on the ground next to me (the coffee table is too far a reach!) and Meg Braff's book on my lap. The images in THE DECORATED HOME: LIVING WITH STYLE AND JOY are as refreshing as a cold bowl sherbet on a hot summer day. Her use of vibrant pastels, bright blues, yellows, greens, pinks and corals not only evoke a sense of calm, but instill a sense of understated sophistication. Her designs are all elegant, are approachable, friendly, liveable and without pretension. Everyone wants a house filled with grace and charm. Throughout the book Braff shares her inspirations and advice on creating spaces that are livable and attractive, maintaining both form and function. She explores the key elements of her look—color and pattern—and how to employ them for maximum impact. 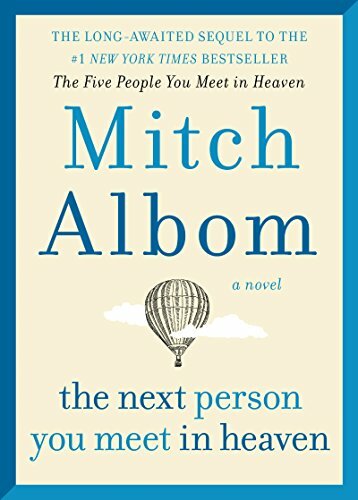 Known for her use of color, especially those "offbeat enough to catch your eye" Braff has an affinity for layering several hues together, as we see throughout the many pages. Of the belief that all variations needn't match exactly, she often pairs unexpected colors together to create a great impact. She considers green a neutral - a color with which all others can be paired, like a garden in full bloom, but admits to favoring one color in particular. Braff is a huge fan of pattern, which she infuses with her love of color, often layering and marrying several patterns together to create rich and storied spaces. Throughout the book she shares her inspirations - her love for detail, antiques, pattern, texture, Chinoiserie, as well as tips for selecting paint color, shopping, styling, and organization. She also shares the essential elements to creating stylish bedrooms, inviting baths and breakfast rooms, and offers up suggestions for creating chic outdoor spaces. She also shares with us the importance of finishing touches - the little extras that elevate a room’s decor from good to great. All of her advice comes together in an overall theme of gracious living that will be warmly welcomed by readers looking to impart polish, color, and grace to their home. Lushly illustrated with vivid images of Braff’s lively work, THE DECORATED HOME: LIVING WITH STYLE AND JOY is an inspiring, idea-filled resource for both novices and experts alike. Born and raised in Mississippi, interior designer Meg Braff has been praised extensively for her ingenious use of color and pattern. Now based on Long Island, Meg Braff Interiors is known for its work intop resort locations including Bermuda, Palm Beach, the Hamptons, and Newport. Braff also owns her own design shop in Locust Valley. There's nothing that makes a home as warm and welcoming as art. It's perhaps the single most reflection of one's self in a home. Highly personal, whether paint, photography, or mixed media, a piece of art serve as an accessory or a focal point. Art adds color, personality, sophistication, even whimsy. It completes a space and is the perfect solution for those who want to add color but are afraid of bold paint or don't want the hassle of wallpaper. A wall filled with art, whether a large painting or a gallery, is a wall that tells a great story. But this takes time. It takes a while to grow one's art collection - piece by piece. I've been hearing a lot of people talk about wanting to buy art for their homes, some know exactly what they are looking for - others not at all. Many are intimidated by the process, worried that they'll buy the wrong thing, or haven't a clue where to start. I tell them it's easy, pick something you like! Art needn't be expensive. But it should come from the heart. There's no right or wrong piece to purchase; beauty, after all, is in the eye of the beholder. The best places to start are by visiting craft fairs, art exhibits, tag, yard and garage sales, flea markets and antique shows. Galleries, even coffee shops, boutiques and salons have pieces for sale, often done by locals. Don't worry about whether you're making a good investment or not - if something speaks to you and you like it, it's a good investment! A large piece is a great way to accent a room. It can anchor or fill a wall. That said, don't hang a small piece on a large wall unless there are others that will be hung with it. Consider hanging artwork on bookcases, or placing them on the shelves. To create a gallery wall work from the middle on out. If you don't have a lot to work with center what you do have in the middle of a wall, so that the room doesn't look off center or unbalanced. If you're coming up short, think of printing one of your own images. We all have phones and they all have images on them. Have fun. You could curate your own in-home gallery! Do use caution when placing art in kitchens and bathrooms, the steam from both could ruin the artwork. Best sticking with framed images in these rooms, as opposed to images on canvas. Wipe down your frames from time to time. Use particular caution in kitchens that aren't well vented - grease is carried in the steam and can place a film on everything. When hanging art in these rooms, be sure to show those that can easily be wiped down. This weekend marks the official beginning of summer and many of you will travel. Whether locally or abroad, when you're roaming around keep your eyes peeled for art to incorporate into your home! 17 Summer wardrobe essentials for the Spring and Summer of 17! 17 Summer wardrobe essentials for the Summer of 17! If you're a regular reader you will know that I am positively mad for tunics. (see here) Worn with jeans, leggings or as dresses, I find them to be perfection. They exude an ease that reflects summer's carefree lifestyle. Every wardrobe needs a tunic... or ten! Because white jeans. I am obsessed. Do I really need to say more? For more click here. Because black never ever fades from style. Ever. Though this might not be my choice on a day that's 90 degrees with 70% humidity! I think that nothing makes me happier than to see these shoes back in the summer spotlight, getting the recognition they deserve. Stylish and comfortable, in a wedge or a flat these traditional canvas top with a rope sole instill a feeling of nostalgia in me. As a child I wore then in a rainbow of colors with wide laces that wrapped around my ankles. They were a popular shoe in the south of France. When I was older, a young teenager and coming into my own in the 1980s, preppy fashion dominated, I felt so sophisticated in my navy Jacques Cohen wedge heeled espadrilles. Images via and via. I am mad about this style top. The halter looks well on everyone and can be worn by everyone. I have several dresses in this style and even more tops. Image via. Forever nauti... blue and white stripes will forever make me think of the water, the ocean, sailing... pairs well with the requisite white jean! Image via. I am delighted that these easy breezy off the shoulder tops are back again this season. These figure flattering and age-friendly tops are proving to have staying power and definitely aren't a flash in the pan. I have a few and adore them. They can be worn during the day or dressed up for evening. If you're well endowed be sure to have a good supportive as well as comfortable strapless bra! Image via. My inner bohemian just adores the freedom of the bell sleeve. I'm delighted to be seeing this style on everything from coats and sweaters to blouses and dresses. I think the key here is ensure that they're not so long that they're getting in the way. An inch above the wrist, 3/4 length and even short sleeves are the way to go with this style. You won't want to wear these while doing the dishes! Image via. Furthermore white is always right in the summer! My exception to the classics rule always lies within the accessories. Here is where you can play and have fun. A fun, fresh and modern accessory can really make and shape an outfit. The Aviators that we've seen so much of over the past couple of years are being traded up for round frames and square frames. Reminiscent of the 60s and 70s these shades are the perfect example of what goes around comes around. We are delighted to see the return of these stylish frames. Image via. My love for the slightly outrageous and dramatic is met with the modern day ruffle. These aren't frilly or froufrou, but sophisticated yet fun. These oversized frills are everywhere from sun dresses to tank tops to pants and even on bathing suits. We love their whimsical vibe and look around you, you'll see them everywhere! Thank goodness deep, dark savage tans are no longer en vogue. Thank goodness women are now favoring a slight, healthy glow over the look of over-roasting in the sun. Some may argue that no amount of sun is healthy. Some may argue that it is best to stay out of the sun altogether. But for many of us this isn't realistic and it doesn't have to be true. While it is indeed best to keep out of the sun's direct rays from about 11:00 - 2:00 PM, you can stay outside if well protected. Sunscreen is your friend. Your ally. Sunscreen can save your life. As long as you use it properly. I am a victim of skin cancer and had surgery to remove some from my collarbone just last year. I am overdue for a screening and it's on my list of things to tackle over the next couple of weeks. As I met with my surgeon last spring, a leading skin cancer researcher, I asked him if it was true that I would need to stay out of the sun. His answer shocked me, I did not have to. But I did need to shield my skin. I also asked about the strength of sunscreen I should be using. I needed nothing stronger than an SPF of 30 he assured me. However, I would need to reapply it frequently. Cover my body fully. Each application, on an average person, requires about a shot-glass worth. I asked him if there was a brand he prefered and his reply was Neutrogena. (It should be noted that one should stay away from sunscreen as coverage isn't as thorough and if using outside much of it can blow off into the wind. I will be honest and tell you that I happen to like a little sunkissed glow. While I slather myself with 30 SPF I also slather on the self tanner. After testing and going through a wide variety of brands I have come to rely on the inexpensive Jergens as my favorite. (There are two that I prefer, both are foam instead of lotion-based, as I feel that sprays and foams cover better, more easily and are less prone to streaking. Above image via Cosmopolitan. Click here to read the article about proper usage and coverage. For more on Spring and Summer Styles that I have written about in the past, click here, here, here, here, and here. I recently came back from a rather spontaneous trip to Palm Beach. The idea was presented to me a few weeks ago and I was told that I needed to get away. But I couldn't, I replied ... "too much to do." And then I thought about it, what on earth was so important that it couldn't be put on hold for a few days? When was the last time I got away simply for the sake of getting away? When was the last time I had a few days without any responsibility or worry? I can't even begin to remember. And so I said "Let's do it!" Soon our flights were booked and so was our room at Eau Palm Beach Resort and Spa. I must admit that I had never before heard of it. I was familiar with The Breakers and The Four Seasons, of course, but not Eau. (Eau is pronounced "Oh" and is the French word for water.) I decided to do a little investigating and was blown away with everything that came up in my search. Eau, it seemed, was something special. The luxury resort has seen top accolades in such prestigious publications as Forbes, Conde Nast Traveller, Travel Channel, Ocean Drive Magazine, The Robb Report, The Chicago Tribune and American Spa Magazine. Eau describes itself, and quite accurately so, as "Palm Beach re-imagined, a wonderland of the unexpected, playful and indulgent. A world apart where happiness reigns and coveted moments brim with surprises that will leave you breathless. Little wonder, you were always meant for something extraordinary." It is a luxury 5-Star Hotel in every sense of the word, without the pretentiousness and rigidity found in many. There's a laid back ease about Eau making it the perfect destination for just about everyone. Planning a couple's get-away? A Girl's Weekend? A family vacation? Eau caters to all, making each guest feel singularly special. After a long, raw, cold winter we couldn't wait to dip our feet in the sand, swim in the salt water and soak up the rays! Upon arrival we were greeted, as all guests are, with a glass of champagne as we waited to sign in at the front desk. It seemed that there were quite a few from our flight also checking in. They had known about Eau and we hadn't? There was a line and it was slow moving. I was surprised that there was just one person checking us all in. As I looked all around me the hotel certainly had the appearance of a 5-star hotel but the fact that so many of us were on queue was quite contradictory and voiced my observation to my partner. Finally it was our turn to check in. I could have said something but I didn't. I was on vacation. I wasn't in any rush. I had no itinerary, no plans, no agenda. We were just going with the flow. As the concierge welcomed us he apologized profusely for the wait and as a thank you for our patience he upgraded us to a room with an ocean view. Had he heard my earlier comment? I wondered. We were grateful and blown away. At the height of the season we had been upgraded. My champagne suddenly tasted sweeter. This indeed was 5-star service. After we got the keys to our room, had our champers refilled we headed to our room. The sprawling hotel is stunning on all accounts. The main level and lobby area boast a very 19th Century, European influence. Oil paintings by British painters lined the hallway walls with assorted Rocco-style and Biedermeier furniture. While the main level had a very old-school Palm Beach vibe to it, the living spaces took on an altoghether different look. 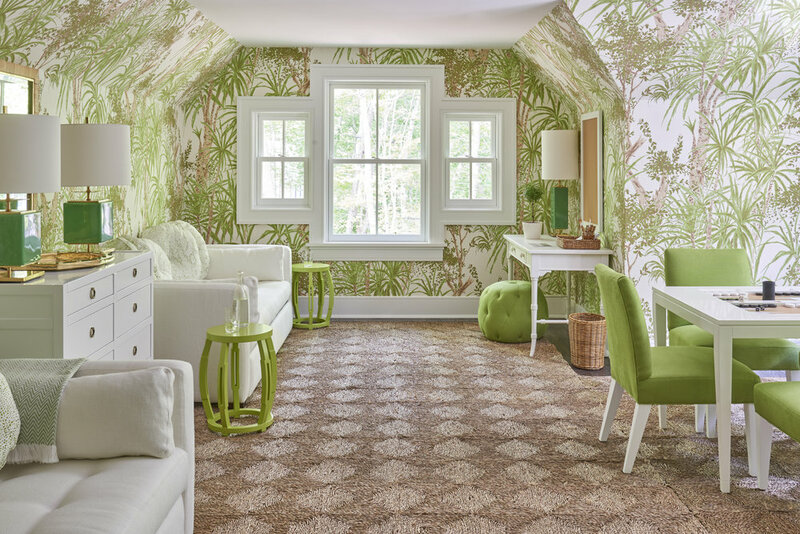 In a partnership with Eau Jonathan Adler put his signature stamp on the hallways, rooms and bathrooms. 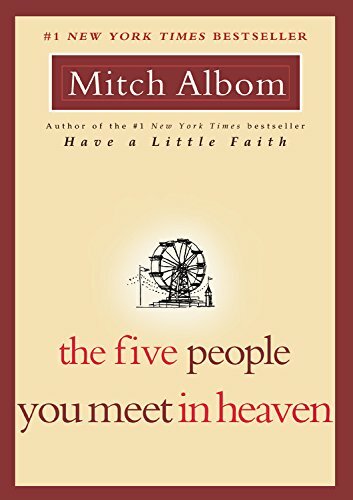 Those familiar with his fresh and vibrant style as well as his tongue-in-cheek humor will recognize his touch the moment you step out of the elevators. We marveled at how new and fresh everything looked. We wondered how recently the collaboration took place and were surprised to learn that it was over 5 years ago. There wasn't a scratch, ding, chip, mark anywhere. All accessories, I would discover, were available for purchase - from the lamps, to the pillows to the planters, coffee cups and artwork. On every bed, greeting every guest, are flip flops and a pool/beach bag in the hotel's trademark aqua and white. This is genius - not only do these make for lovely momentos but serve as great PR once the guests return home. I, in fact, have recommended Eau to several of my friends since my return. On the second day of our stay we came up from the pool with a note on our bed. There had been a watermain break in the hotel and we were asked not to drink the tap water for 24 hours. Instead, we would be delivered extra bottles of water. A watermain break? We hadn't noticed - service was, as far as we could tell, uninterrupted and seamless. The bathrooms defined luxury, modernity and practicality. I'm mad about the navy campaign-style vanities. One of the things we noticed immediately was just how wonderful and fresh everything smelled. This is not at all by accident. The hotel has teamed up with Votivo candles and had a signature scent created just for them. My greatest regret is not picking up one (or two!) before I left. Although I was on a mini vacation I did have some work to take care of. This chic Adler desk flanked by a whimsical Slim Aarons photo and sweeping views of the Atlantic Ocean puts my own home office to shame. This greeted me every morning. I sat on the balcony every morning with my cup of coffee and surrounded by nothing but ocean breezes, the sound of the waves and a mental clarity I just can't get at home. But enough about the rooms.... we didn't come to Palm Beach to be inside all day! Outside one finds all sorts of different seating areas... some poolside, some overlooking the beach, some by the lobby, some by the bar and the two restaurants, Breezes and Temple Orange, in addition to the large outdoor fire-pit which was most welcome in the breezy night air. The hotel also boasts two outdoor pools. One family-friendly while the other is geared to those seeking peace and quiet. Even though we were traveling without children, we couldn't help but notice how family and kid-friendly the hotel was, with all sorts of activities for a wide range of ages. Perfect for families and those with the very young, many of the ground level rooms come with their own cabanas. 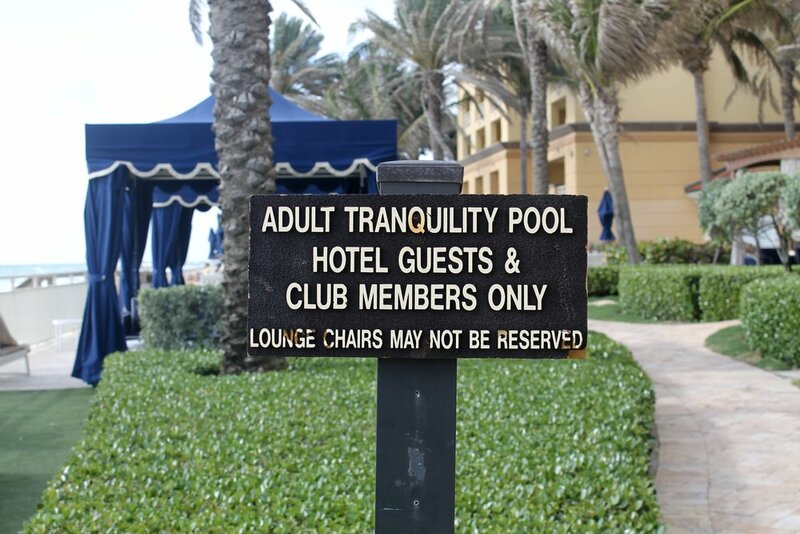 For the rest of us, the Tranquility Pool! As you enter the pool area one of several pool-side workers will set your chair for you. There is fresh fruit infused water set up at the towel stand and you can help yourself to as much and as often as you'd like. The poolside bar opens just before noon. You can order up a virgin or booze infused daiquiri to sip whenever you please. We pretty much stuck to the fruit-infused waters. Lunch can be eaten poolside as well. We ate poolside one day and headed to Temple Orange the next. While poolside we ordered the Mahi Mahi lettuce tacos... I think it was perhaps the best fish taco I have ever had! Above, the Tranquility infinity pool on a cloudy day facing the hotel. Below, on a sunny day facing the ocean. I should note that these are saltwater pools. That's right. The healing powers of salt and none of the harsh and harmful chemicals and effects of chlorine. Salt water pools are my favorites! Our greatest regret, I think, was that we did not take advantage of the spa and all the spa services offered. But with our stay being so short we really just wanted to take advantage of the warm sunny weather. The Spa itself is beyond. With over 42,000 square feet of space, it is truly a playground for adults to unwind and relax. For images and more on the spa click here. Really do click! Now to the dining. Temple Orange is where we ate breakfast every morning. Careful to keep our diets in check we ordered egg white omelets twice and created our own. They were divine. To die for actually. There's also a buffet which looked absolutely fabulous, but that was more food than we wanted in the morning. We also ate lunch there one day. I ordered the Salade Nicoise which didn't disappoint, and a healthy portion of seared tuna, and my partner ordered the Ratatouille Bowl with slow cooked veggies, freekeh, chickpeas, arugula and tahini. Also divine. The restaurant is open throughout the day. You're on vacation, after all and shouldn't have to adhere to any meal schedule! Prefer to eat Poolside, then Breeze Ocean Kitchen is where you'll order from... That sublime Mahi Mahi taco was from Breeze. The folks at Eau describe Stir as "a relaxing place to enjoy the hotel's atmosphere adjacent to the lobby with a light menu available. By night, experience the transformation as Stir becomes the center of evening activity. Choose your favorite libation to enjoy on the oceanfront terrace around the firepit. Enjoy light bites, appetizers, cocktails and specialty coffees alongside live entertainment on the weekends. On Thursday evenings, enjoy our Butcher's Block featuring indulgent selections of meats and cheeses, and on Fridays and Saturdays, treat yourself to fresh sushi at our weekend social." We enjoyed many of their creative libations and glasses of wine both inside by the fireplace and outside by the firepit. In addition to the fine dining, the myriad of activities offered to children of all ages, the hotel boasts a state of the art fitness center with yoga, pilates, and sculpting classes for guests at a nominal fee for those who make fitness a priority. Refreshing Welcome – From the moment of arrival, guests will sense a break with convention. Greeted with chilled oshibori towels and Champagne in a freshly revitalized porte-cochère, guests will enter the resort through a lush outdoor living space and into a relaxing environment with a breathtaking view of the sparkling Atlantic Ocean. Gourmet Picnic A Go-Go – A new fleet of custom designed picnic bicycles, created just for Eau Palm Beach by Republic Bicycles, allow guests to take the Eau experience on the road with a gourmet lunch and beach blanket . A map of local bike routes puts a fun spin on seeing the sites of Palm Beach Island. Mediterranean Bounty – Embracing both the current trend towards healthy, Mediterranean fare and the melting pot of American cuisine, Eau Palm Beach has introduced a new menu at Temple Orange, beginning with a new signature Mediterranean Breakfast, featuring savory Mediterranean-inspired selections, charcuterie, cheeses and fresh fruits. Beauty Blueprint – The Eau Spa, a 42,000 square foot award-winning glamour oasis at the heart of Eau Palm Beach, will feature the Detox by Design program. This wellness initiative is a personalized three-day wellness trifecta combatting holiday overindulgence and perfecting guest's red-carpet look by combining a gourmet juice program, fitness and meditation instruction and rejuvenating spa therapies. Private Splashtopia – Guests relax and renew in oversized soaking tubs in a water wonderland guestroom bath experience featuring a tub-side waterproofed "Water Alive" book, soothing bath crystals, bath pillow, tray and signature candle featuring the Palm Beach breeze scent. Nightly Lobby Turndown – The Eau Palm Beach team takes their role as curators of fun to a new level by setting the tone each evening with a new Lobby Turndown. As the sun sets, the lobby is illuminated over with 100 candles. On Friday and Saturday, guests are offered complimentary Champagne and invited to toast the new Palm Beach lifestyle. Other new events include "Living Room Session" musical performances; weekend nights punctuated by the electric sounds of the hottest DJ's; Asian street food evenings and hand-rolled sushi paired with expertly mixed Sake-tinis. Where the Cool Kids Are – From a pint-sized theater and rock climbing wall and create-your-own- stuffed animal workshop for Eau Palm Beach's youngest guests to a DJ lab with turntables and mixing equipment, a mini-spa, photo studio and GoPro camera rentals for the hard-to-please teen set, passions are ignited at Aquanuts kids and COAST teen programs. Our stay at this fabulous luxury resort was all too short. The staff were courteous, pleasant and helpful. There was always someone on hand to assist us with our every need. The rooms are glorious and pristine. The food and beverage were of the highest quality. While we had not hear of Eau Spa and Resort, it is now on our radar and we look forward to our return to take advantage of all they have to offer! The Mule is a must have shoe for every wardrobe. Image via All For Fashion Design. My love affair with this simple slide began decades ago when I was young - It was the late 1970s and early 1980s and the era when the bell bottom, peace love and happiness transitioned quietly into the early days of disco and jumpsuits. The shoe I'm referring to, of course, is the clog. How I so fondly remember my beloved wooden soled clogs. During the cooler season I wore my clogs and when the weather was warm out I proudly donned my Dr. Scholl exercise sandals. Over the course of several years I would own all three colors, red, white and blue... there might have even been a denim version as well. The other memory is that of my mother yelling at me as I clomped loudly across our wood floors. I wasn't exactly the quietest or most graceful of children, and I would soon learn these shoes were best worn outside. (I grew up in an old pre-war apartment on the Upper East Side with the most spectacular wood floors. Despite the large oriental and shag area rugs I still managed to sound like an elephant walking on two-by-fours!) Eventually, my love for these most un-delicate of shoes faded into a quiet oblivion only to be replaced by something else. Fast forward ten years or so and fresh out of college and my go to shoe was a simple black kitten-heeled mule. Although that particular pair is no longer in my closet, my shoe racks are filled with countless versions of these backless shoes. Perhaps it has something just a tiny bit to do with my own laziness, but mostly it is because I find this style of shoe to be comfortable, extremely flattering and incredibly versatile. I wear my mules about 80% of the time. And now as the weather has warmed and the snow has melted we can look forwards to giving our boots a break and slipping into a pretty mule. And once again they're all the rage - from the pages of your favorite fashion magazines, to the runways to the streets.... From The Gap to Gucci, from Aldo to Valentino, the mule is is the shoe style to slip into this season. Peeptoe glam makes this sophisticated mule appropriate for the workplace and the cocktail apres! Image via Freshnet. Edgy snakeskin mules for the forward thinking gal. Image via The Alternative Bride. Original Source unknown. Stylish flat mules complement a casual weekend wardrobe. Image via Emerson Frye. We adore these tassel flat mules from JCrew. Image via JCrew. Carolyn Bessette Kennedy looked stylish in mules in the 1990s. This timeless look remains fresh today. Image source unknown. Elegant kitten heel mules offer a casual elegance. Image via Cosmopolitan. When it comes to interiors I've always had a flair and preference for the dramatic and the bold. I like rooms that have a commanding presence, that surprise you with detail, that entertain and delight. Not every room in a home need make a statement - that could easily overwhelm - but it's always fun to discover a space that is completely unexpected, that surprises and delights. I've also always been drawn to ceilings that haven't been ignored. In other words, those that haven't been left behind under a coat of white paint only to be forgotten. I love those that are painted, papered and I especially adore tented ceilings. Whether in a garden room, playroom, child's bedroom, pool house, bathroom or study, these fun and whimsical tops are sure to delight. Because it's nice to walk into a room that brings a smile to your face. If there's one piece of clothing that I just can't live without, it's the little black sweater. If I had a uniform, the black sweater would be it. It seems that I wear one every day - universally flattering and appealing, not to mention versatile. Due to the myriad of styles the little black sweater is such that it can be worn year round. (A black sweater in summertime? Of course, one needs to cover up in those frigid air conditioned buildings.) I don't think that one can have too many - thick, thin, long sleeved, short-sleeved, sleeveless... in cashmere, linen or cotton. Worn on their own, under jackets, coats, or over blouses, their flexibility is perhaps unrivaled. Always sophisticated, the black sweater ranges from casual to elegant and complements a wide range of accessories from pearls and baubles to scarves of assorted sizes, sizes and textures. I have lost count of all the black sweaters to grace my wardrobe, and it is quite likely this collection will continue to grow by leaps and bounds. Celebrating the Little Black Sweater. Image via Be. Daze. Live. There's one, singularly and without exception, item that every woman's wardrobe must have that's truly ageless, timeless and versatile. It is the little white blouse. It's a style that looks well on young and old alike. It's one of the first serious pieces we purchase in our youth as we embark on our careers, and it keeps evolving throughout our lifetime. The little white blouse may sound simple by description - but by description only. It perhaps the most versatile, flexible and diverse of all the items in our wardrobes, with the exception of the little black sweater. The blouse, however, takes on many shapes and styles and forms from fitted and figure hugging to loose and forgiving thus also making it a favorite for many body types. A white blanket of snow, topped off by inches of ice, covers everything in sight for as far as my eye can see. Although Spring is a mere days away, we are deep in a frozen tundra. Although our mudrooms are overflowing with down parkas, mittens, hats, scarves and boots I am envisioning the good days ahead... The days filled with warmth and sunshine, rosy cheeks, pink and green buds, pastel flowers and gentle breezes. I look forward to shedding these layers bit by bit... I look forward to the days of light sweaters, but even more so, to those days when we can freely bare our arms and shoulders! The past couple of summers saw the popularity of bare shoulders and this trend doesn't seem to be passing us by any time soon. I happen to adore this - I think a woman's décolletage is incredibly beautiful and this is a style that suits so many so well. As I no longer wear figure hugging tops, I think the shoulder-baring style is incredibly forgiving and flattering. I also love the sleeveless look, revealing our feminine yet strong arms. Below, some of my favorite looks - both casual and dressy... The warm weather will be here before we know it! Least, that's what I'm telling myself! Spring Fashion Favorites :: The Right to Bare Arms. Image via Bows & Sequins. I can think of no better time to curl up with a book about magnificent homes on the water than now, in the midst of a midwinter snowstorm. Although Spring is just days away, the landscape beyond my window is reminiscent of a scene at Christmastime with a foot of crisp white snow blanketing everything within my view. A thick layer of ice lies above the snow keeping even the hungriest of squirrels and fox at bay. Nary a bird - cardinal or robin - to be seen on the many bare trees in my backyard. When in bloom the trees form a natural screen, shielding me from neighbors and passersby. But now the veil is lifted and I can see miles away... On a clear day I can see the large ferries carrying cars and passengers on the Long Island Sound. But today everything is white, the sky, the ground, and everything in between. As I open the book I am transported to summertime and reminded why I have chosen to live in my oh so very tiny home... I have chosen it for its location, its proximity to the water and the many small beaches that line my town's edge. There is something about the water... there is something about living on or near the water... It instills a sense of calm. It brings one closer to nature. It inspires. It invigorates. And so on this brutally cold March afternoon, I set aside all my worries of work and projects and deadlines. I give into the confines of my home, comfortable, warm, safe from the elements, and pour over the stunning pages of The Seaside House: Living on the Water, savoring each and every image. Of course, one needn't a snow day to appreciate and to be inspired by the stunning homes. 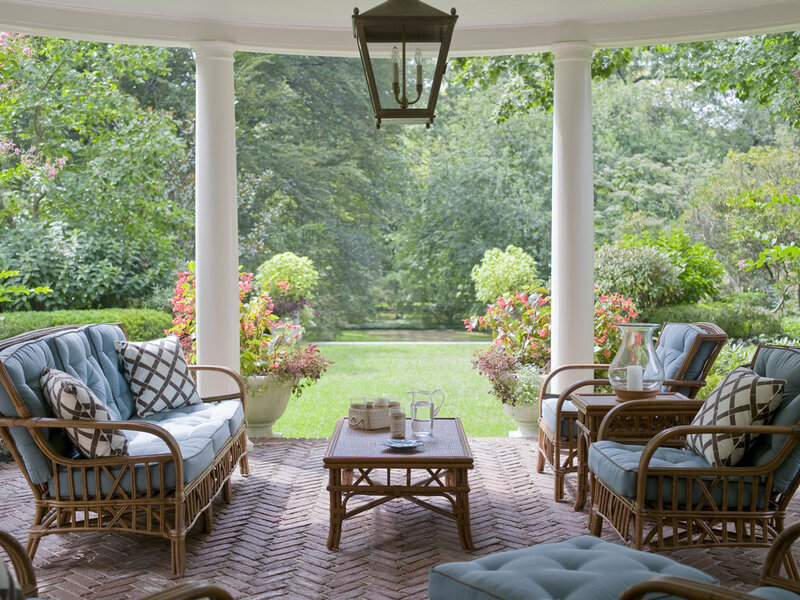 A shady porch, a breezy patio, a stunning balcony, a relaxing bedroom all offer the perfect setting... a glass of wine, a lemonade or warm cup of tea as you savor each beautifully photographed home - interior and exterior. 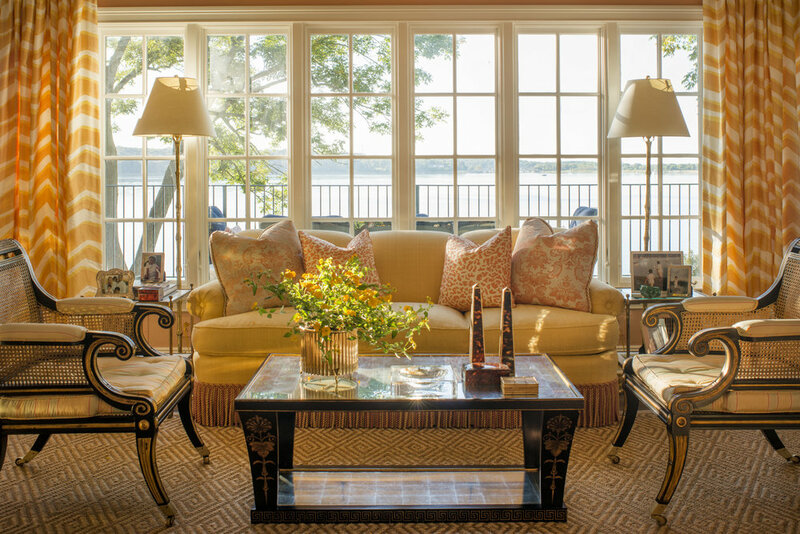 For those who dream of a house on the water, whether it is an ocean, lake or river, The Seaside House: Living on the Water, brings us there - if only temporarily, offering everything from clean, modern beach houses to traditional style cottages. These breathtaking homes will inspire you and anyone who loves a water view. We are given a privileged sneak-peak inside the homes of Martha Stewart's Seal Harbor, Maine residence and Giorgio Armani's Antigua Getaway. 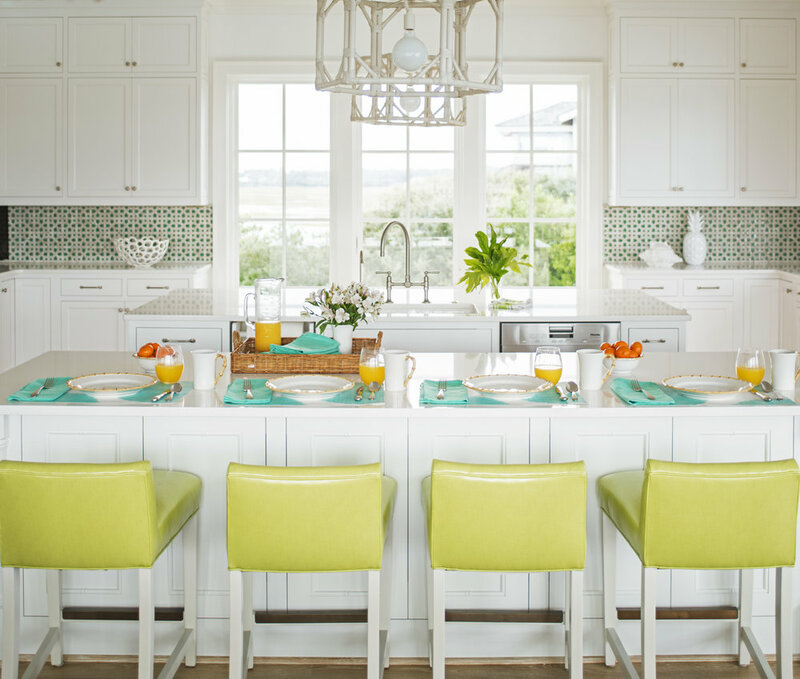 In quintessential communities such as Block Island, Nantucket, Malibu and Harbor Islands, these homes have been decorated by such revered designers as Steven Gambrel, Martyn Lawrence Bullard, Celerie Kemble and Ken Fulk. Nicks, Voulgaris III is the author of Hinkley Yachts, a restrospective on the iconic yacht builder. His forthcoming books include the legendary boat company, Chris Craft and the New York Athletic Club. Nick is the proprietor of Kerber's Farm, an historic farm and retail brand located on Long Island. He lives in New York's West Village with his English Labrador, Charlie, and in the summer aboard his sailboat in Shelter Island. Douglas Freidman is a New York based fashion/interiors photographer whose work has been published in Harper's Bazaar, InStyle, ElleDecor and Vanity Fair, among others. I received a complimentary edition of The Seaside House: Living on the Water by Nick Voulgaris III, Rizzoli NY 2017. The thoughts and views are solely my own.